These pictures prove that all cat owners absolutely need a glass table in their house. Our furry friends love to sit and stare at the world around them, but when they choose a flat surface to lay on, they give us a view we don’t have the chance to see everyday… and it’s oddly funny. 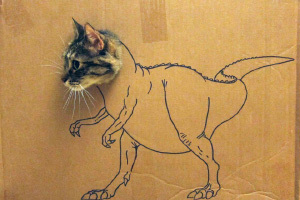 If you enjoyed this gallery, you may also like Cats In Cardboard Tanks, Dinosaur Cat Haircuts, and Ninja Cats. love the way they tuck their feet in. Where y’all see toe beans, I see upside down teddy bears! I want to see photos of the people taking these photos. Several of these cats have that long enduring look of suffering the never-ending antics of the staff. When will it end? How they lord over things. Cats. Those two tubs on that thin glass better be careful they don’t shatter it. lol. Have you never heard of the lipstick test ?